Aveiro is a city in Portugal that carries the charm of the Iberian Peninsula – beautiful, colourful and full of unexpected destinations. The climate in the region is perfect for tourism, as well as for practicing water sports, there are historic sites in the town, and its canals are reminiscent of Venice. The boats and canals of Aveiro – Probably one of its biggest attractions are the canals that cut through the town from the centre to the ocean shore. For centuries, the canals and the lagoon have been the centre of the local economy, today they are Aveiro’s trademark. 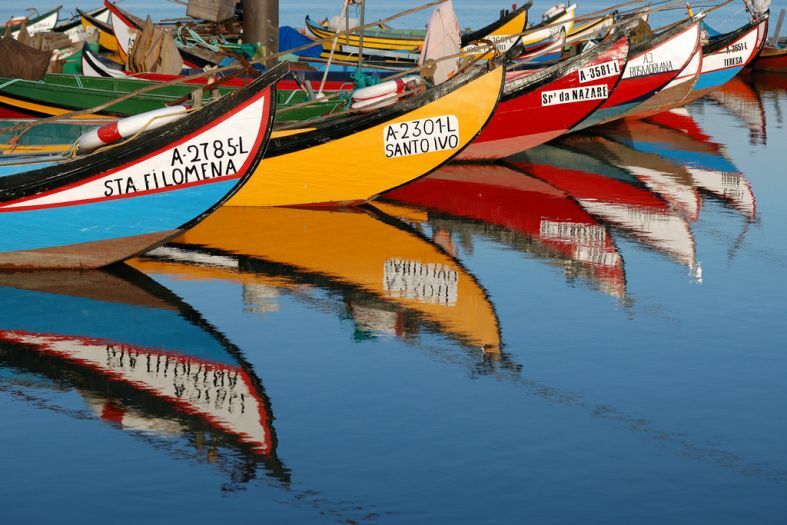 The painted boats, typical for the Aveiro region are called moliceiros – they were once used for gathering algae to fertilize the farmlands outside the city, while today the locals use them mainly to drive tourists around. Vista Alegre Museum – The Vista Alegre Factory was built in the beginning of the nineteenth century and since then many well-known porcelain goods have been manufactured there. The factory museum was created in 1964 and renovated in 2001, and nowadays there can be seen wares from the very beginning of the factory, information about the evolution of the brand, and you can also see the entire process of creation of porcelain wares. The museum is open Monday to Sunday from 10 am to 7 pm. More information here. The Aveiro Cathedral – The Church of Saint Dominic (São Domingos) was built in 1423 and substantially renovated in the 16th and 17th century. The church and the adjoining monastery used to be barracks that were later burned down, and on the remaining ground the current Cathedral of St. Dominic was built. The cathedral is located on the city square next to the Santo Antonio Square, the fish market, Forum Aveiro and the lagoon. If you want to enjoy this edifice, the best time to visit is earlier in the day, before the cathedral is overflowing with the faithful and tourists. The Aveiro Museum – This museum is one of the most famous buildings in Aveiro, because it is part of Portuguese royal history. The museum, within the limits of which is also located the building of the Jesus Monastery, used to belong to the Dominican Order. The daughter of King Alfonso V – Joanna wished to become a nun, however her father was opposed. Despite that, she took a monastic vow in 1472, and this helped elevate the prestige of the monastery. Joanna stayed in the monastery until the end of her life, and was declared a saint because of the miracles she performed. Nowadays in the Aveiro Museum tourists can see religious artifacts, paintings from the fifteenth to the eighteenth century, authentic furniture and ceramics. The museum is located across from the Cathedral of St. Dominic and is open throughout the year (with the exception of Mondays and holidays), from 10 o clock in the morning to 5:30 o clock in the evening. The entrance fee to the Jesus Monastery itself is 2-3 euro. More information here. The coast – The climate in Aveiro is rainy in November, December and January, while in July and August it is dry. That is when tourists vacation on the beaches of Sao Jacinto, Barra and Costa Nova. From Costa Nova you can begin an ocean cruise, because there is a yacht club there, while the winds are the perfect prerequisites for windsurfing and kitesurfing. Food in Aveiro – Most of the restaurants are between the Old Neighbourhood (Bairro Antigo) and the fish market (Mercado de Peixe), but good places can also be found in Barra and Costa Nova. Be sure to try Aveiro s traditional product ovos moles, which is made from egg yolks and sold in most bakeries.